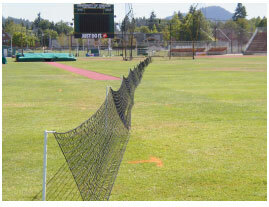 20 lb break strength discus net stands 2’ tall and 60’ long. Held by 3/4” diameter steel net poles and ground stakes. 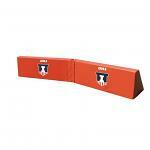 Effectively stops shot or discus from rolling or skipping outside of the throwing sector. Use 1 net to cover the shot put sector and use 3 for the discus sector. Polyethylene net spools included for convenient storage and handling. CA Proposition 65 Warning: This product contains chemicals known to the State of California to cause cancer and birth defects or other reproductive harm.